Size: Fish is almost 19 inches long! This is simply a beautiful display fossil. It is a very large fish from the Green River Formation of Wyoming. This large plate (over two feet across!) 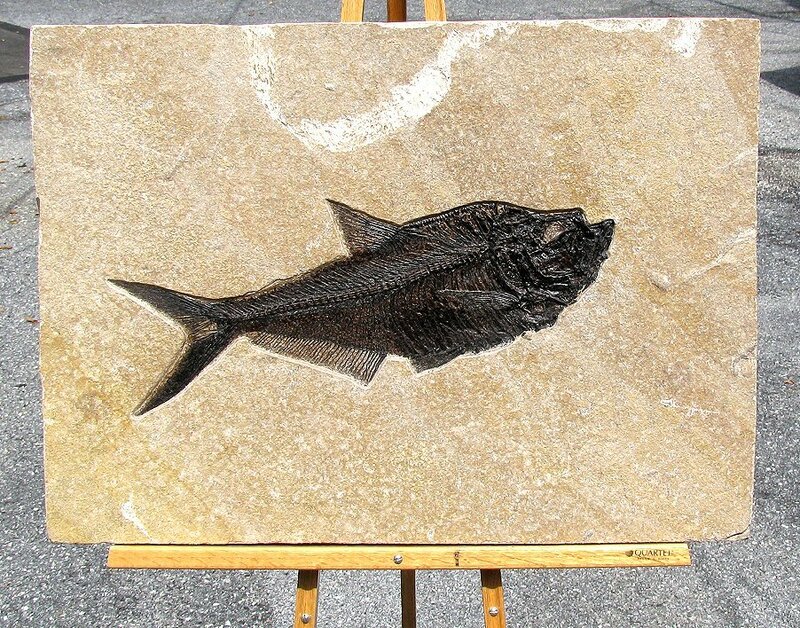 has an excellent Diplomystus dentatus fish preserved on the slab. The massive fish is easily seen and quite distinct. This fish fossil has great bone structure and extremely fine detail preserved - especially on the backbone, fins, and tail. The dark-colored fish contrasts well with the khaki-colored matrix plate. The amazing fossil is beautifully displayed on the large,squared matrix plate of shale. And the fish is almost NINETEEN inches long, which is an extremely large fossil fish! This is a very impressive fossil fish plate, showcasing a very large, very well prepared Diplomystus fish from Wyoming.